The discovery of two dead police dogs in Hialeah, Florida has prompted an investigation into their handler, Officer Nelson Enrique. On Thursday, the Hialeah Police Department announced that the two dogs—a 7-year-old bloodhound named "Jimmy" and "Hector," a 4-yr old Belgium Malinois—had died after being left inside Officer Enrique’s vehicle for several hours. Enrique had worked the graveyard shift on Tuesday evening and arrived home sometime early Wednesday, according to authorities, after assisting in a missing person case that had him working longer hours than usual. Later that evening at around 7 p.m. ET, police in Davie, FL received a phone call from the officer and responded to the Enrique residence where they found the two dogs dead inside of the cop’s SUV. "I am deeply saddened to learn of the tragic death of two remarkable police dogs from the Hialeah Police Department,” said Don Ryce from the Jimmy Ryce Center, the organization that donated the bloodhound to the force seven years earlier. “Our mission is stronger than ever and with the public's help we hope to be able to raise funds to replace these dogs,” Ryce said. The SUV was towed from the scene late Wednesday, according to local media, and the Davie Police Department has opened up an investigation into the incident. The Hialeah PD will reportedly conduct an internal probe into the matter as well. “The Hialeah Police Department is extremely saddened by this unfortunate occurrence and every effort will be made to determine the cause of this terrible tragedy which claimed the lives of two very beloved members of our Hialeah Police family,” Hialeah police spokesman Carl Zogby said in a statement. "Officer Enriquez is relieved of duty pending the outcome of the investigation." It was not immediately clear if Enriquez, a 13-year veteran of the Hialeah PD, will be paid by the city during the course of the investigation. Prior to this week, he had worked as a dog handler with the department for seven years, the Miami Herald reported. 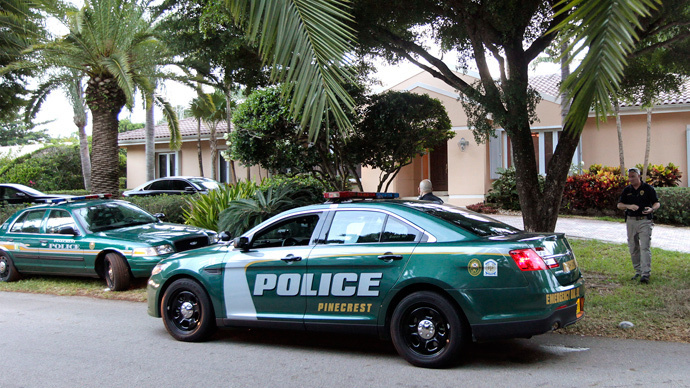 "This officer Enriquez lives in a wonderful home in Davie," Zogby told reporters on Thursday. "He's got a big backyard, he's got two beautiful kennels in his backyard and he definitely loves and pampers his dogs. They do and can live in the house. He can put them in the kennel when the weather's right, but no, they lived in the house with the officer. They're full members of the family. In fact, I'm hearing his children wouldn't go to sleep if the dogs weren't in the house." According to the Weather Channel, temperatures in Davie on Wednesday ranged from 76 to 87 degrees Fahrenheit. The Department of Geosciences at San Francisco State University has reported that the temperature inside a vehicle parked in 80-degree weather may spike to 125 degrees in less than an hour.